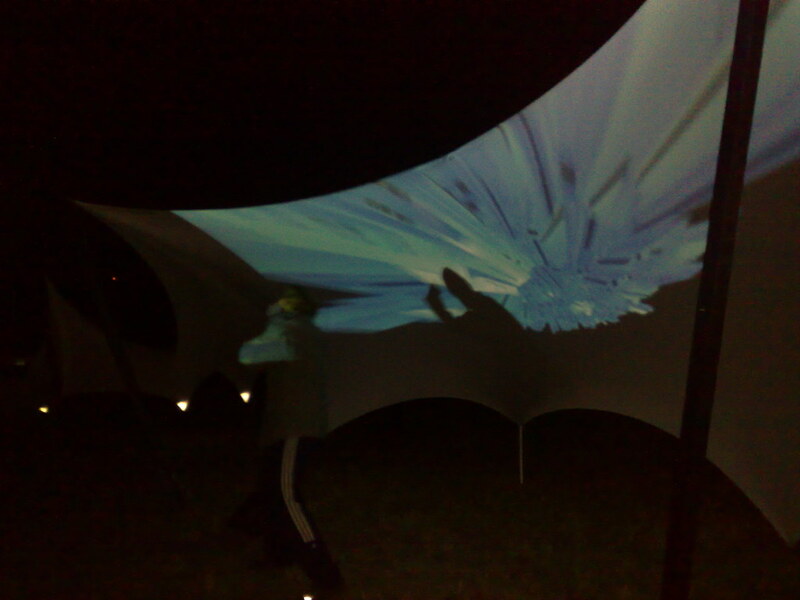 Constellation 2.0 was a temporary interactive audio/visual installation for the Electric Eclectics festival in Meaford Ontario, 31 July 2009 to 2 August 2009. This installation is an attempt to engage the visitors with the site and create a unique spatial experience, sensitive to the surroundings with minimum impact on the site. Using tensioned strips of white fabric on light temporary structure and solar powered LED lights, the Constellation 2.0 will create a habitable enclosure that allows small gatherings and engagement with a potential interactive audio/visual installation. During the day, this skin surface will act as a shade while harvesting solar energy for the performance and at night glow and become a screen for the gathering/performance space The scattered light points will be positioned to reflect the stars and the constellations of August night sky, diffused on the white skin and into the field. The light nodes will also become the anchor points for the fabric to structurally connect to the ground. The grass around the nodes will be trimmed by one meter radius to accommodate the visitors stay. The trimmed areas of the field will be connected to one another to create paths and encourage the visitors to explore this unique site. Constellation 2.0 is responsive to natural and man-made physical pressures in the built environment (Wind, Sunlight) as well as user inputs (tactile/touch). The fabric and tensioned strips are equipped with piezoelectric sensors responding to the wind and people’s interactions. These interactions are manifested in the form of sound and light. For example, the sensed acoustic vibrations are processed and spatialized across the nodes and effects the sound and video projection on the surface. The Constellation 2.0 stretches for 100′ and is built around 7 nodes.